HESI TNT Complex is a high quality plant fertiliser for green potted plants, flowering plants and in particular orchids. TNT Complex is particularly effective, but very gentle to plants. One reason for this is that the nitrogen is almost 100 % organic (urea), and thus protects the sensitive orchids. In this way, among other benefits, the plants are loaded with a minimum of salt, which is optimal for young plants and especially orchids. 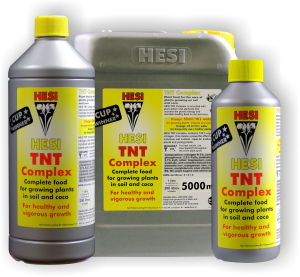 HESI Root-Complex, HESI TNT-Complex and HESI SuperVit complement each other ideally. During the growth phase (spring to autumn), fertilising can be carried out with 25 ml TNT /10 litre water without hesitation, in winter with 10 ml / 10 litres. ATTENTION: important information!!! The nitrogens contained in TNT Complex are almost completely of organic origin. Thus, they are not to be determined through the conductance. Do not dispense with the EC device!! !